As I’ve talked about previously, we don’t use erythritol in our kitchen, so the challenge for us was to come up with a cake that we could sweeten using stevia without having it taste weird. Enter lemon cake! Lemon goes well with both coconut and stevia, allowing us to make this with coconut flour and sweeten it with stevia. If you need a quick gluten-free dairy-free cake, this is right for you as well! If you’re not watching carbs, a mild raw honey (use 1 tablespoon per packet of stevia called for) works well in this recipe as well. You may need to increase the baking time a touch when using honey. Heavy whipping cream is not GAPS-friendly since it contains lactose, so use coconut milk instead. If you’d like to make a small batch of cupcakes, this recipe will fit into 6 cupcake liners. After they have cooled, pop them in the freezer and your GAPS kiddo (or yourself) can bring them along to classroom celebrations and birthday parties without feeling left out. My daughter’s teacher has already requested I bring half a dozen of these for her to keep in the classroom freezer, which I’m thrilled about! Being low-carb, these cakes are not the exact same consistency as wheat cake made with real sugar and flour. But they can really satisfy a cake craving and are delicious on their own. These mug cakes are a little more custardy-soft than traditional cake. Mimicking treats can be a challenge when you are low-carb or allergy-free baking. Sadly, we cannot make healthy food taste and feel exactly the same as the food that got you sick in the first place, so we make-do with yummy substitutes. But they are just that, substitutes. 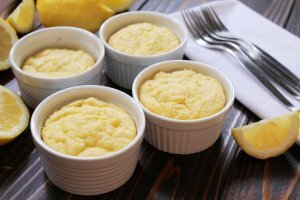 The post Keto Lemon Lemon Mug Cake Recipe (GAPS & Dairy Free Option) appeared first on Health, Home, & Happiness.